LAKE STATION, Ind. 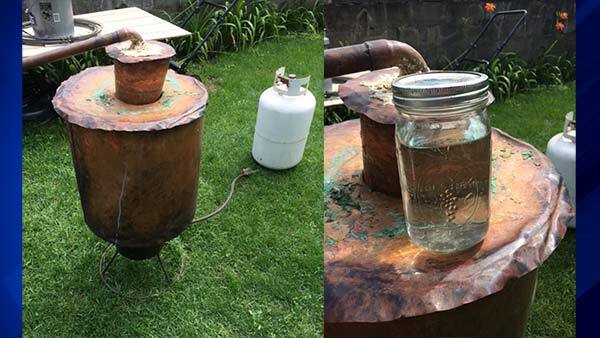 (WLS) -- Indiana State Excise Police seized moonshine and the still in which it was allegedly manufactured from a Lake Station, Ind., residence Thursday, officials said. Police said the Excise officers acted on information provided by the Lake Station Police Department, and served a search warrant in the 3600-block of Minnesota Street. There, officers found a copper still in a shed in the backyard of the residence and as well as alcohol allegedly produced by the still inside the residence. Police say preliminary testing of the beverage found its alcohol content to be 132 proof. The 50-year-old owner of the home, Anthony J. Metz, has been charged with possession of untaxed alcoholic beverages and possession of unlicensed equipment for production of alcoholic beverage, both misdemeanors.